Mainstage Theatre is officially registered as Thespian Troupe #699, in association with the Washington State Thespians and the International Thespian Society. 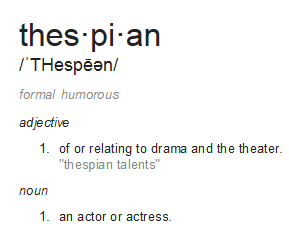 Students involved in Mainstage Theatre can apply to become members of Thespian Troupe #699. The International Thespian Society is an amazing organization that provides countless opportunities for growth, learning, leadership, and fun. We participate in all of their state events and often attend Nationals in June! Students can compete at I/E (Individual Events). There are six categories for actors and many for student technicians. The acting categories are monologue, duo scene, group scene, solo musical, duet musical, and group musical. These are held in Olympia in late January/early February. At this contest, students who perform in the top 20th percentile place regionally, and the top 10th percentile are eligible for state and national qualification. The top 10th percentile can compete to showcase at the state festival and compete at nationals. While competing at Nationals can be fun, the best part is the multitude of workshops and shows. It is like a theatre camp; activities start early and end late, and you learn much. The national festival is held the last week of June in Lincoln, NE. The cost of registration, food, lodging, etc. is usually around $700, but the airfare gets us. Flying to Nebraska is not cheap, but it is oh, so worth it. Troupe #699 generally meets once a month to discuss fundraisers, have fun, and plan community service and school service activities. This year's Thespian Officers are Delaney Morgan, Aysha Pomerinke, Ed Orcutt, Melaina Hayes, Grace Zacher and Emma Chang. You do not have to be an inducted thespian to participate in thespian events, so come on out and have some fun!